Gardner looked lost for much of the game, especially in the 2nd half. What little momentum Michigan did have, disappeared after halftime. Eventually, the poor field position the Wolverines had almost the entire 2nd half took it's toll as Michigan had no answer for the Iowa defense. Michigan's defense had some big stops in this game, including some key interceptions. They looked good, but spent just too much time on the field. The offense, Devin Gardner especially, was unable to do anything in the 2nd half where Michigan was outscored 17-0. It seems that Devin Gardner is playing with absolutely no confidence right now. None. Maybe even negative confidence, if that's possible. I don't know where Michigan goes from here. With their 4th loss of the season and the soon to be 11-0 Buckeyes coming up to the Big House next week, all there is to play for is spoiler. But that's almost impossible to imagine. If Michigan doesn't get blown out next week, I'll be very surprised. The needle on the Fire Borges Meter™ was broken off weeks ago, and this loss will do nothing but give his detractors more fuel. The back-to-back reverses early in the 3rd quarter, I thought, was an especially horrible couple of downs that sabotaged one of many terrible Michigan drives. There's no excuse for that, that's just unacceptable. For their 12th game of the season, the final game for these seniors in the Big House, it's going to take a historic effort, and a lot of lucky bounces to just keep it respectable. Maybe we'll become a Michigan basketball blog. 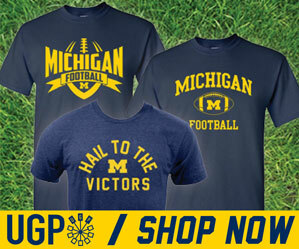 Hoke, Mattison, and Borges all need to go. Hoke shows no emotion positive or negative when strolling the sidelines. His players follow suit on the field. Mattison lines up the exact same defense almost every play. The offense becomes comfortable with the few looks that Michigan provides by midway through the first quarter and eats us alive after that. We couldn't stop a good high school offense right now. As far as Borges, what is he thinking? He has absolutely no answer for the pass rush that our last four opponents have mounted. Get rid of the ball quickly and learn how to burn the blitzes, all good college teams can do this. And finally, goodby to Devon Gardner, what a huge disappointment. Any chance Hoke would start the freshman (against Ohio State) who could be quarterbacking the Wolverines next season? 52-3 Ohio State!